IMAGE: The ORCAS field campaign will use a flying lab to learn more about the air-sea exchange of gases in the Southern Ocean. Credit: Graphic by Alison Rockwell NCAR/EOL. BOULDER — A team of scientists is launching a series of research flights this month over the remote Southern Ocean in an effort to better understand just how much carbon dioxide the icy waters are able to lock away. The ORCAS field campaign–led by the National Center for Atmospheric Research (NCAR)–will give scientists a rare look at how oxygen and carbon dioxide are exchanged between the air and the seas surrounding Antarctica. The data they collect will help illuminate the role the Southern Ocean plays in soaking up excess carbon dioxide emitted into the atmosphere by humans. "If we want to better predict the temperature in 50 years, we have to know how much carbon dioxide the oceans and terrestrial ecosystems are going to take up," said NCAR scientist Britton Stephens, co-lead principal investigator for ORCAS. "Understanding the Southern Ocean's role is important because ocean circulation there provides a major opportunity for the exchange of carbon between the atmosphere and the vast reservoir of the deep ocean." ORCAS is funded by the National Science Foundation's Division of Polar Programs. "Building on decades of U.S. Antarctic Program research, new questions of global significance continue to emerge," said Peter Milne, program director of Ocean and Atmospheric Sciences in the Division of Polar Programs. "ORCAS addresses one of those questions: how the Southern Ocean affects global climate by storing, or releasing, carbon dioxide, water vapor, and heat." Carbon dioxide, the main greenhouse gas contributing to human-caused climate change, is continually transferred back and forth between the atmosphere, plants on land, and the oceans. As more carbon dioxide has been released into the atmosphere by the burning of fossil fuels, oceans have stepped up the amount they absorb. But it's unclear whether oceans have the ability to keep pace with continued emissions. In the Southern Ocean, studies have disagreed about whether the ocean's ability to act as a carbon sink by taking up carbon dioxide is speeding up or slowing down. Measurements and air samples collected by ORCAS–which stands for the O2/N2 Ratio and CO2 Airborne Southern Ocean Study–will give scientists critical data to help clarify what's actually happening in the remote and difficult-to-study region. The ORCAS field campaign will operate out of Punta Arenas, near the southern tip of Chile. The researchers plan to use the NSF/NCAR HIAPER research aircraft to make 14 flights across parts of the Southern Ocean between Jan. 15 and Feb. 28. 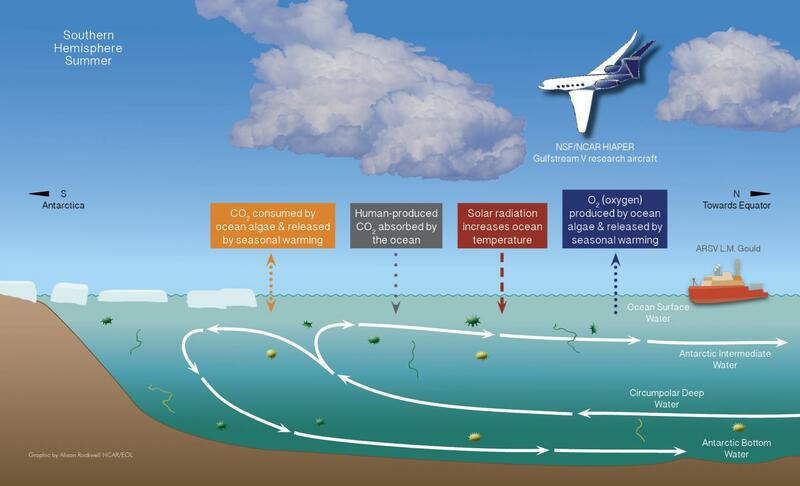 A suite of instruments on the modified Gulfstream V jet will measure the distribution of oxygen and carbon dioxide, as well as other gases produced by marine microorganisms, aerosols, and cloud characteristics in the atmosphere. The flights also will observe the ocean color–which can indicate how much and what type of phytoplankton is growing in the water–using NASA's Portable Remote Imaging Spectrometer (PRISM). The addition of the PRISM instrument to the ORCAS campaign was funded by NASA. The science campaign is being led by Stephens and NCAR scientist Matthew Long. Other principal investigators include Elliot Atlas (University of Miami), Michelle Gierach (NASA's Jet Propulsion Laboratory), Ralph Keeling (Scripps Institution of Oceanography), Eric Kort (University of Michigan), and Colm Sweeney (Cooperative Institute for Research in Environmental Sciences). CIRES is a partnership of the National Oceanic and Atmospheric Administration and the University of Colorado Boulder. The management of the field campaign is being handled by NCAR. Logistics include everything from obtaining diplomatic clearances from multiple countries to fly through their airspaces to providing housing and workspace for project scientists in South America. Measuring oxygen alongside carbon dioxide can give scientists a clearer picture of the ocean processes affecting carbon dioxide than they would get from measuring carbon dioxide alone. "The air-sea exchange of carbon dioxide is controlled not just by physics but also by biology," Long said. "There's a nice relationship between the fluxes of oxygen and the fluxes of carbon dioxide that can be exploited to gain insight into these processes." Carbon dioxide in the ocean is drawn into a chain of chemical reactions that buffer the impact of biological and physical ocean processes on carbon dioxide in the overlying atmosphere. Oxygen air-sea fluxes, however, are more directly tied to these same biological and physical factors. So if scientists know what's going on with oxygen, they can better understand the processes affecting carbon dioxide as well. Additionally, if scientists know how the concentrations of the two gases change relative to one another with location and time, they can disentangle how biology and physics separately affect the ocean's ability to absorb carbon dioxide. Physics and biology affect the ratio of carbon dioxide to oxygen in the air in different ways. In the austral spring the warmth of the returning Sun drives both carbon dioxide and oxygen out of the Southern Ocean surface and into the atmosphere. But the sunlight also triggers the growth of phytoplankton in the water. As the organisms begin to flourish, they take in carbon dioxide and release oxygen, causing the relative amounts of those two gases in the atmosphere to shift in opposite directions. Observations of these shifts can ultimately tell scientists how much carbon is going where and, more importantly, why. The Southern Ocean is unique among Earth's oceans. Unimpeded by continental landmasses, and driven by a westerly wind, the Southern Ocean is able to form a circular current around Antarctica. This huge flow, the largest current on the planet, connects the adjacent Atlantic, Pacific, and Indian oceans. The complex interactions between this Antarctic Circumpolar Current and currents flowing in from other ocean basins creates an overturning circulation that brings deep water to the surface where it can exchange gases with the atmosphere before it is returned to depth. Once it dives toward the ocean floor, that surface water–and any carbon dioxide it takes with it–can stay sequestered in the deep ocean for hundreds or even thousands of years. Data collected by the ORCAS flights will help determine how much carbon dioxide goes along for the ride. "The Southern Ocean provides a window into the deep ocean, but it's a difficult system to simulate in our Earth system models," Long said. "It's remote, and so there has been a paucity of observations that can be used to improve the models we have." The data generated during the field campaign will be used by the ORCAS team to improve these global computer models so they do a better job representing the complexities of the Southern Ocean. The data set, which will be managed by NCAR, will be publicly available. While the measurements made during the ORCAS campaign will help scientists fine-tune what they know so far about the Southern Ocean, it's possible the project will also bring to light entirely new aspects of how the ocean works. "The Southern Ocean is very inaccessible, and existing measurements are from ships or surface stations that represent only a few tiny dots on a huge map," Stephens said. "The airborne measurements we take will be helpful in terms of understanding the system better. And because we're doing something that no one's ever done before, we're likely to find things that we aren't expecting." The NSF's Division of Polar Programs manages the U.S. Antarctic Program, through which it funds researchers, coordinates all U.S. government research on the southernmost continent, and provides logistical support needed to make the science possible.